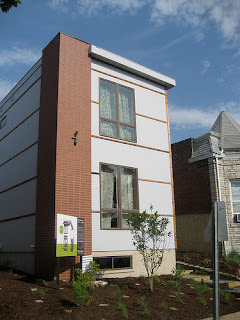 Over 150 people joined us and Mayor Francis G. Slay on the hottest day of the year to celebrate the opening of EcoUrban's first home built in Benton Park West at 3140 Pennsylvania - St. Louis hottest green address. While the home took less than a month to build, from concept to reality more than 2 years of work was on display. We were overwhelmed with how well our first home came together and while we already have a list of planned improvements - Version 1.0 is a home to be proud of. Now we just need some folks to buy this home (which is just the 6th LEED-Platinum home in the country) or to buy our home and build it on one of our 14 lots or on land anywhere they can imagine. Project Manager Jay Swoboda with Mayor Francis G. Slay at Opening.